Carotid artery disease refers to the build-up of atherosclerotic plaque in one or both common and internal carotid arteries, resulting in stenosis or occlusion. The majority of carotid artery disease is asymptomatic, but it is also responsible for approximately 10-15% of ischaemic strokes, due to plaque rupture and/or atheroembolism. In this article, we shall look at the clinical features, investigations and management of a patient with carotid artery disease. Figure 1 – Atherosclerotic plaque from a carotid endarterectomy specimen. The pathophysiology of carotid artery disease is as for atheroma elsewhere, starting with a fatty streak, accumulating a lipid core and formation of a fibrous cap. The turbulent flow at the bifurcation of the carotid artery predisposes to this process specifically at this region. The major risk factors for carotid artery disease are age (≥65 years), smoking, hypertension, hypercholesterolaemia, obesity, diabetes mellitus, history of cardiovascular disease, and a family history of cardiovascular disease. Much of the detailed initial assessment for a patient presenting with a stroke is typically beyond the scope of a vascular surgeon. The Oxford Stroke (Bamford) Classification provides a system to classify stroke symptoms in relation to the arterial regions involved (see Appendix). On examination, a carotid bruit may be auscultated in the neck, however this is associated with carotid stenosis in less than half of cases. Other than the clinical features from stroke, carotid stenosis (even with complete occlusion) is likely to be asymptomatic if unilateral. This is due to collateral supply from the contralateral internal carotid artery and the vertebral arteries, via the Circle of Willis. In addition, non-cerebrovascular conditions that manifest neurologically should be considered. These include hypoglycaemia, Todd’s paresis*, subdural haematoma, space-occupying lesion, venous sinus thrombosis, post-ictal state, and multiple sclerosis. 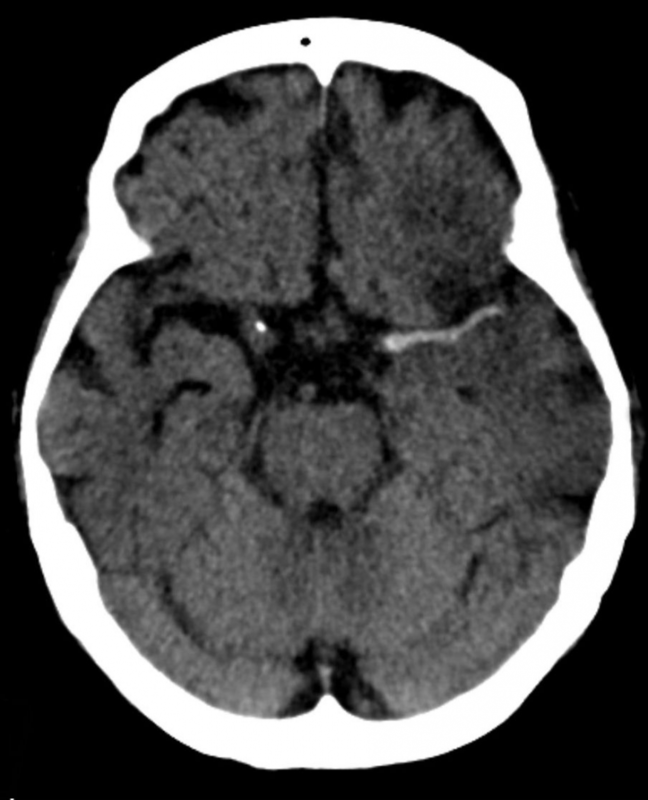 Any patient suspected of ischaemic (or haemorrhagic) stroke should have an urgent CT head scan (Fig. 2) to check for infarction potentially amenable to thrombolytic treatment. Once a diagnosis of ischaemic stroke or TIA is made, it is important to screen the carotid arteries for disease precipitating the presentation. This can be done initially with Duplex ultrasound scans*, which gives a good estimate as to the degree of stenosis, as well as excluding any other possible differentials. Lesions within the carotid artery should then be further characterised with CT angiography (CTA) which gives a more accurate percentage stenosis and characterises the diseased portion of the vessels for potential surgery if the USS scan shows a greater than 50% stenosis. All patients admitted with a suspected stroke should be started on high flow oxygen and blood glucose optimised (target 4-11mmol); a swallowing screen assessment should also be made on admission. Patients presenting with symptomatic carotid artery stenosis ≥50% should be referred for surgical revascularisation (see below). Patients with asymptomatic carotid artery stenosis of >70% are very rarely surgical treated at present unless they are young and have had a symptomatic contralateral stenosis. A referral to the Speech and Language Therapy (SALT) team is advised for any dysphagia or dysphasia. Physiotherapy and Occupational Therapy input is advised for any ongoing mobility issues, with many stroke patients requiring rehabilitation. The mainstay of surgical treatment for ischaemic stroke prevention is via a carotid endarterectomy (CEA)*. A CEA involves removing the atheroma and associated damaged intima, thereby reducing the risk of future strokes or TIAs. Initially the artery is isolated and clamped, before an arteriotomy is created and often a temporary bypass shunt placed for the duration of the procedure. Shunting is especially important for any contralateral occlusive disease to minimise any cerebral hypoperfusion. The plaque and diseased intima are carefully dissected from within the artery, with careful attention not to create any free edge that could result in dissection. The arteriotomy is closed with a patch graft to prevent iatrogenic stenosis and reduce the risk of re-stenosis. 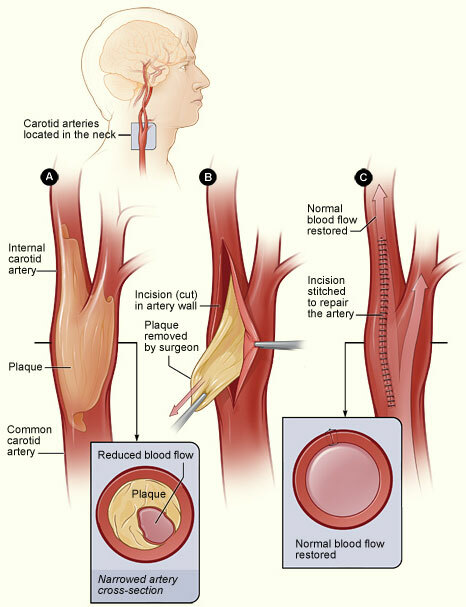 Figure 3 – Carotid endarterectomy, the mainstay of surgical intervention in carotid artery disease. Mortality of a stroke is 12% at 7 days and 19% at 30 days. The most significant improvement from rehabilitation occurs between 4-6 weeks, yet 50% of survivors will remain dependent at 1 year. This is significantly less in patients that are fit for carotid endarterectomy, however this is a preselected cohort, and those with a high mortality post-stroke will not be candidates for CEA. Other complications of a stroke include dysphagia, seizures, ongoing spasticity, bladder or bowel incontinence, and depression, anxiety, or cognitive decline. Which of the following is NOT a risk factor for carotid stenosis? Pharmacological and lifestyle management for carotid stenosis include all except? A patient presents with motor loss affecting their right arm only. An ischaemic stroke is suspected. Where has the occlusion occurred?